There are no two ways about it – Rosewood London is a fine example of what a hotel is all about. 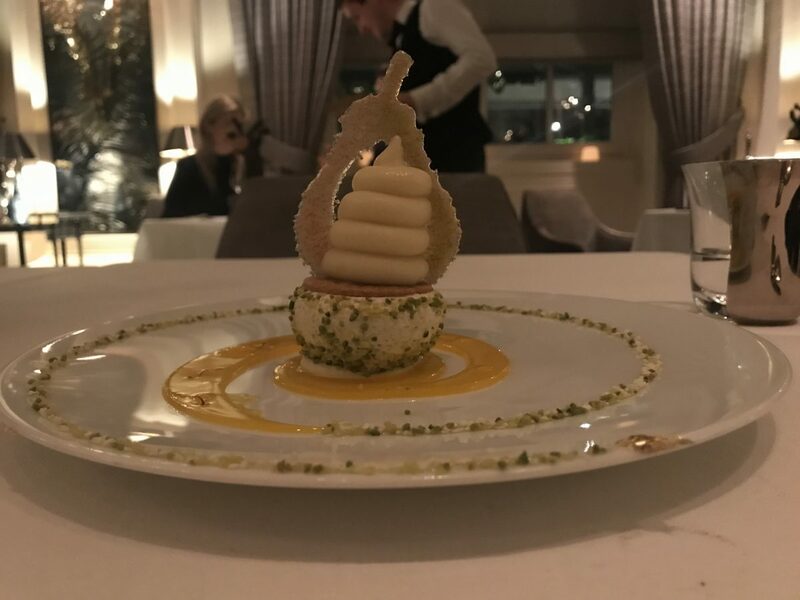 I’ve written previously about the hotel’s glorious suites and pastry-dazzling restaurant on the blog. 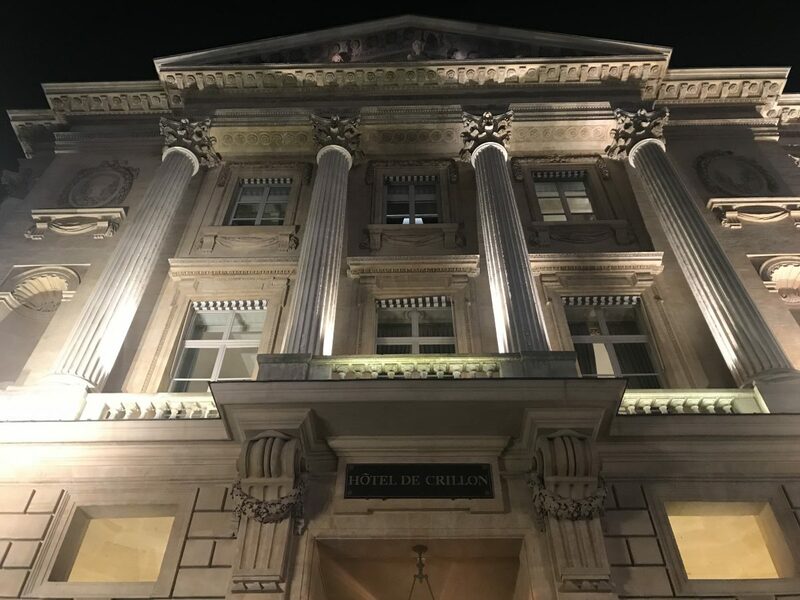 I was excited then to see what their Parisian sister, Hotel de Crillon, A Rosewood Hotel, had to offer. It’s a veritable fun house of beautiful bits and bobs. From the entrance you can see the Eiffel Tower, there’s a cocktail bar in a grand, gold leaf-clad room, there’s a courtyard which looks onto the swimming pool below, there’s a cute brasserie and boutique. 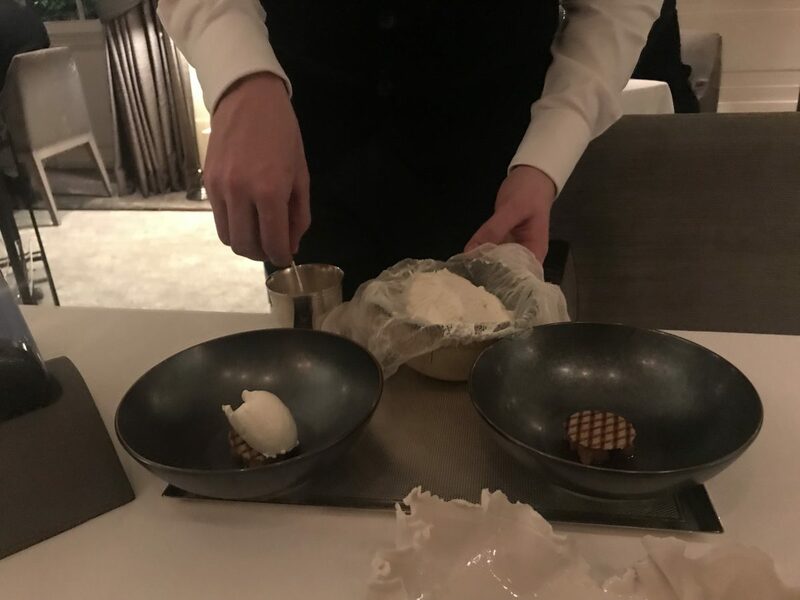 The restaurant, L’Ecrin, received a Michelin star just six months after launching. 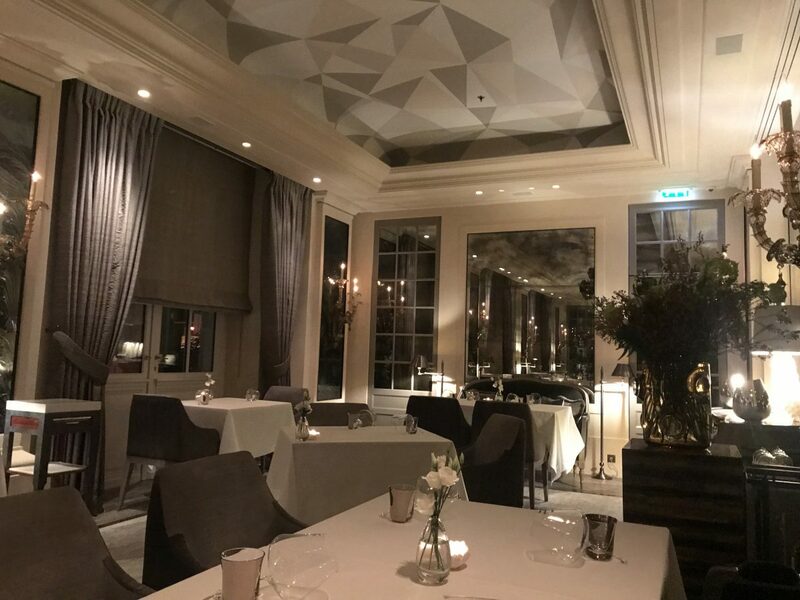 It’s a hidden dining room in the centre of the hotel – you have to be shown there by a doormen which feels super exclusive. It’s a small, elegant space with a formal atmosphere but service is friendly enough to stop it feeling stifling. We start with a glass of Champagne served in a glass with no bottom. 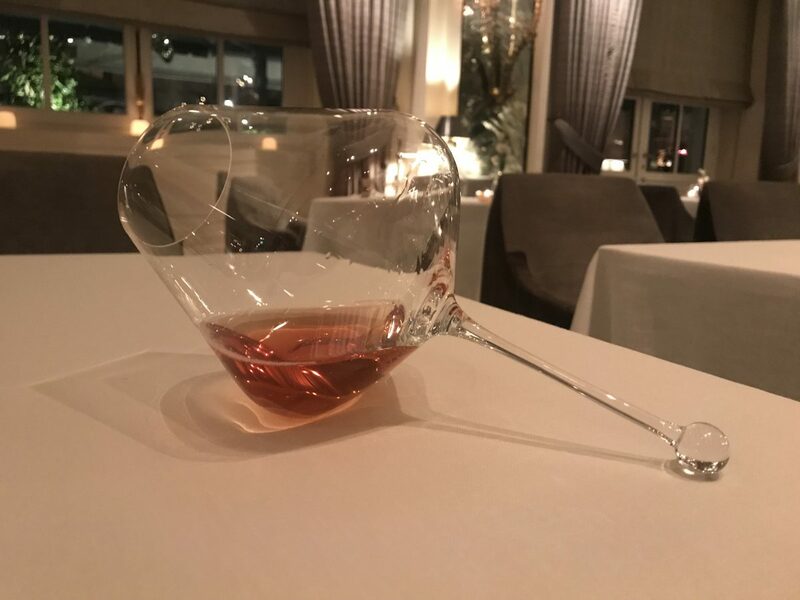 It sits sideways on the table, even when full, which is quite a spectacle. 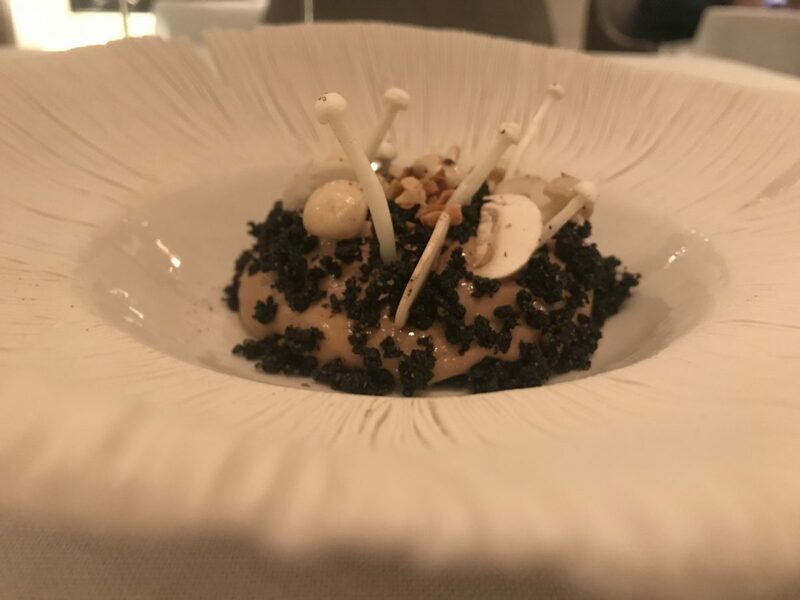 We opt for 7 courses, or “ways”, (€195 per person) which starts with ‘the famous Champignon de Paris’. It’s a mushroom concoction with a texture similar to fresh tofu. There’s raw mushroom and a mushroom crumb. It’s sweet, creamy, malty, umami. 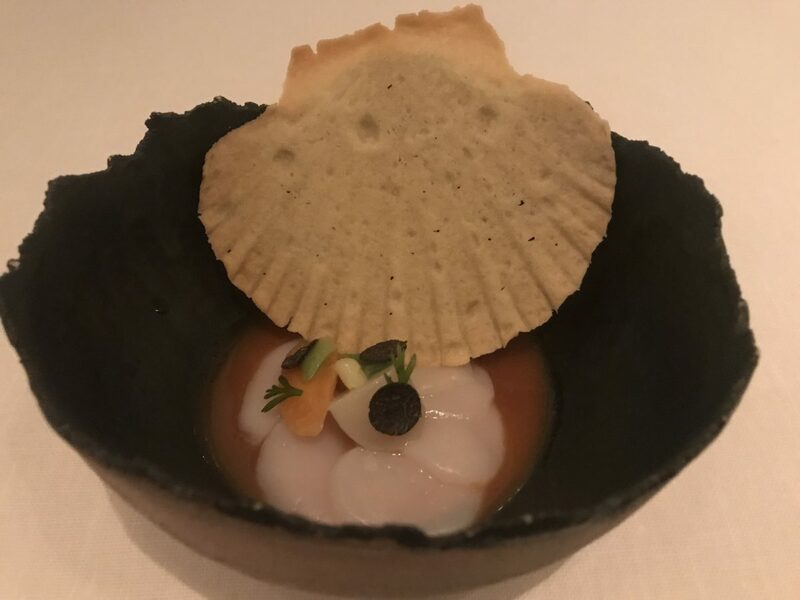 Scallops are served in the style of pot-au-feu which is a French peasant dish, a stew if you like. The thickly sliced scallop is raw with the freshest flavour. A biscuit shaped as a scallop shell provides texture. 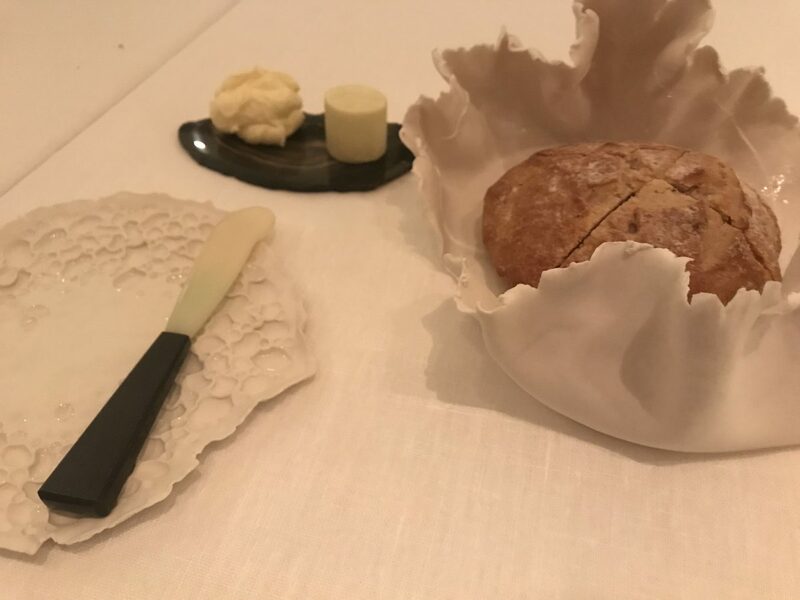 Multigrain bread and two types of butter are served on gorgeous plates. In fact, all the crockery, especially designed for L’Ecrin, is beautiful. 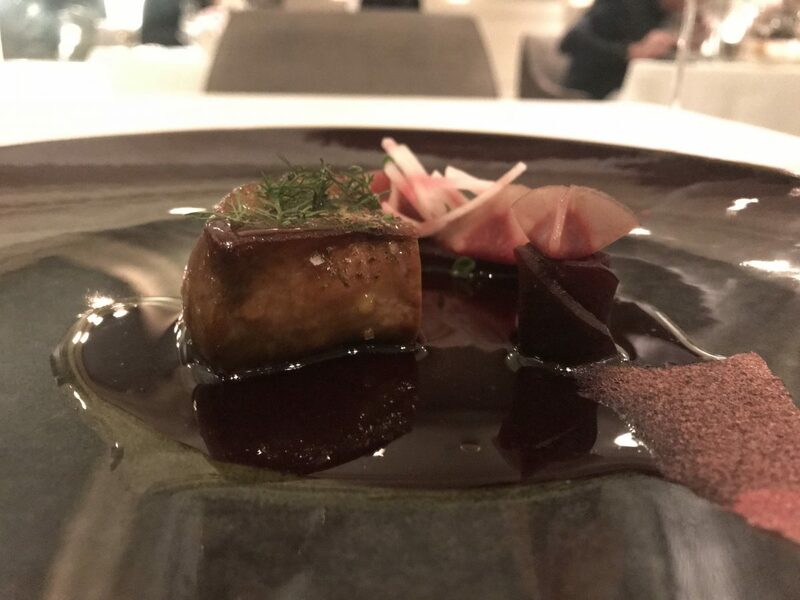 A small piece of duck foie gras with fermented beetroot is our favourite dish. 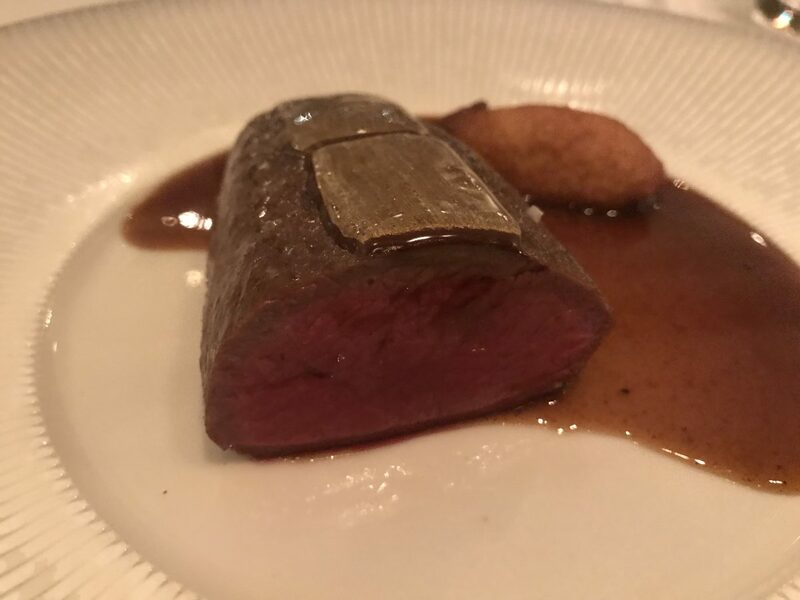 It’s an exquisite piece of foie with the perfect blend of soft and bouncy textures. 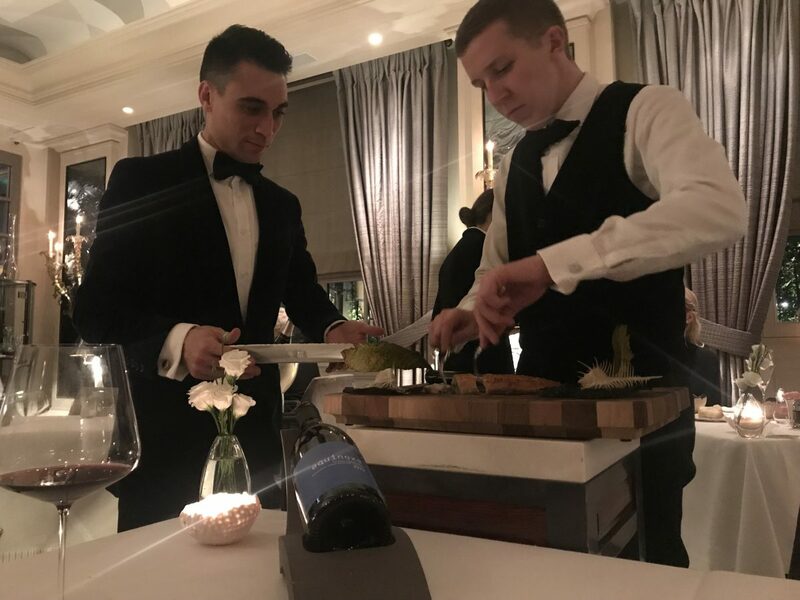 Our next dish is prepared table side, dover sole with black truffle. 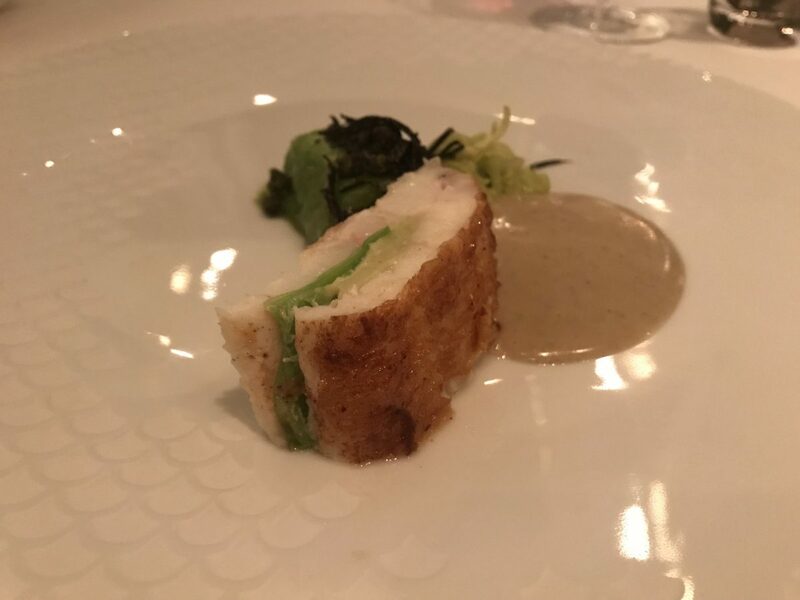 The fish is taken off the bone and is somehow seamlessly stuffed with wilted lettuce. The cooking of the fish is spot on while a rich and creamy truffle sauce adds some punch. It’s proper wow. Our final savoury dish is venison, all dashingly pink and tender. What’s most intriguing is the chocolate. The meat has been brushed in strong, rich, caramelly chocolate. First bite is slightly strange. Then you get used to it. Then it works. Very clever. There’s a delicious side of slow cooked leg meat in a frothy sauce for added yum. 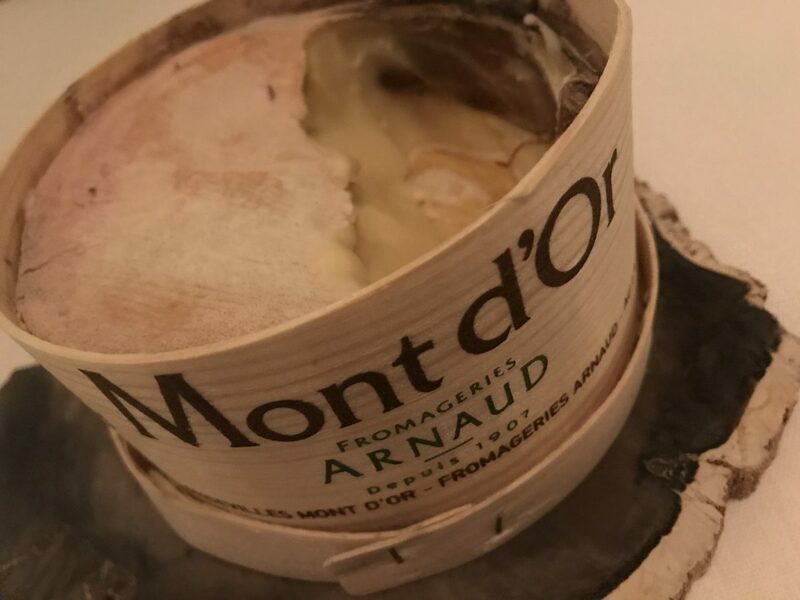 Cheese comes in two parts; homemade fresh cheese which is an unusual mouthful to say the least and a generous spoon of creamy Mont d’Or. For me, there is no finer cheese in all the land. We take a second spoon without hesitation. I could have probably managed a third. A stunner of a dessert sees a dainty pear shaped biscuit standing tall in the middle of the plate. There’s saffron, meringue, pistachios, fresh pear, pear cream – loads going on but it really works. 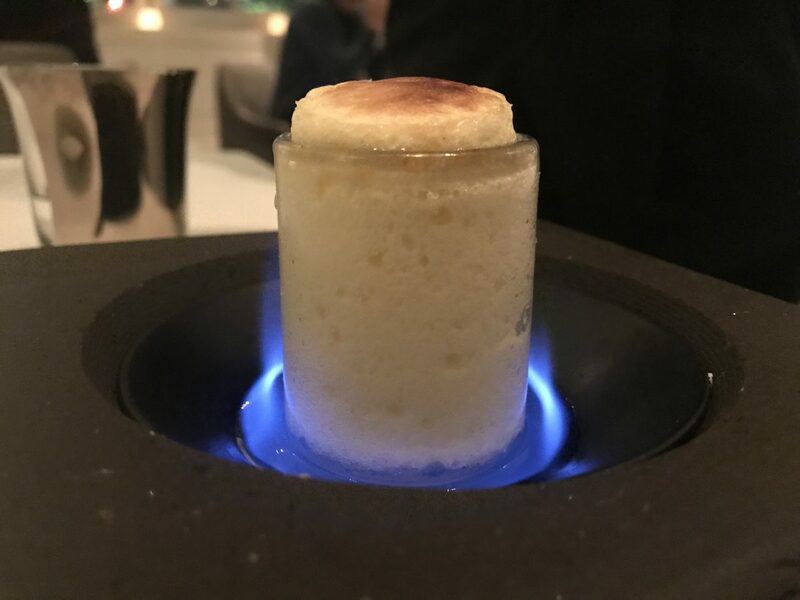 There’s theatre in the form of a shot glass of flambeed soufflé which rises right before our eyes. It’s impressive but most importantly it’s bloomin’ tasty. The attention to detail in this place is quite incredible. Even the coffee is served in a piece of machinery which is beguiling to watch. It’s called a Balancing Siphon Coffee Brewer FYI. 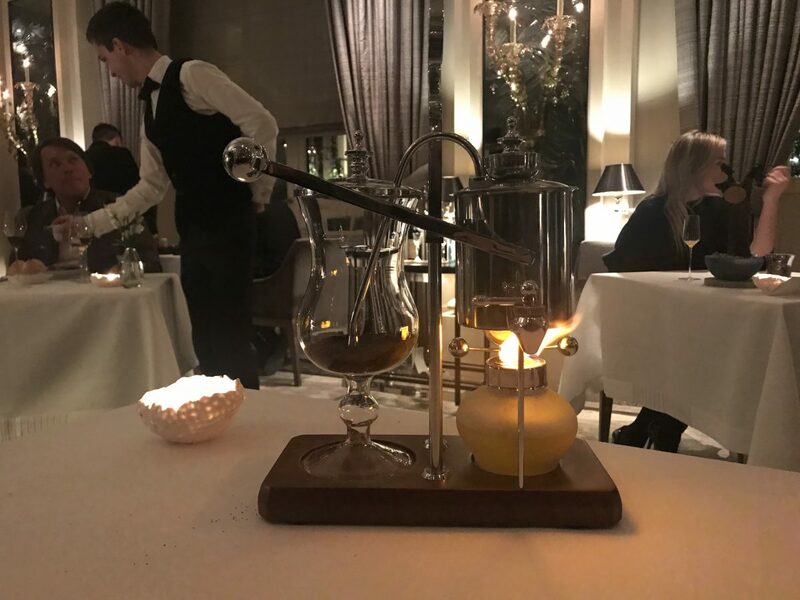 We watch as the water boils on an open flame, vapour brews the coffee then travels back into the jug, all of which happens automatically. Very impressive. 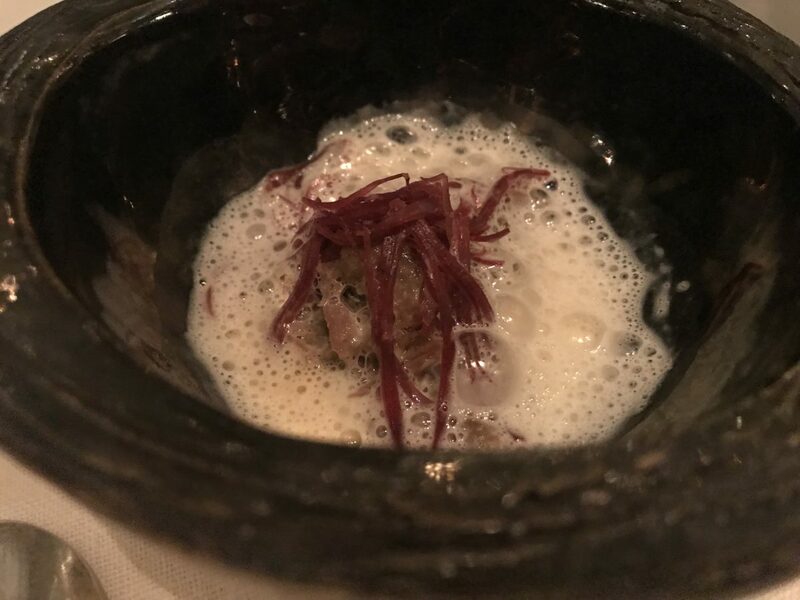 L’Ecrin is a modern and exciting fine dining French restaurant fully deserving of their first star. Chef Christopher Hache and the team are clearly firing on all cylinders. And the hotel is a stunner too. If you’re visiting Paris, this one is a must.